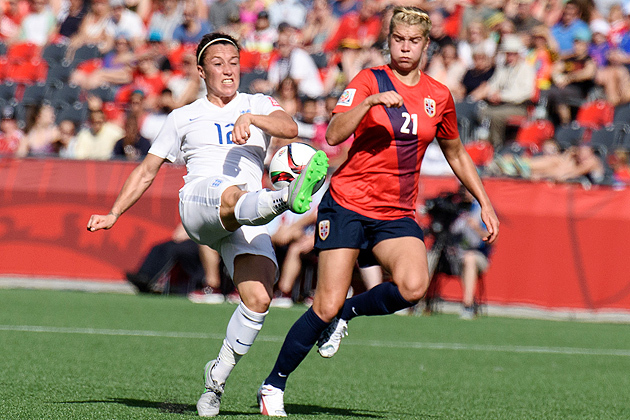 England advanced to the Women's World Cup quarterfinals against Canada in a 2-1 victory over Norway. Lucy Bronze scored the game-winning goal in the 76th minute. Ottawa, Ontario (AP)—Lucy Bronze scored in the 76th minute, and England rallied to beat Norway 2–1 Monday night for its first knockout-stage victory at the Women's World Cup. Steph Houghton began the comeback for sixth-ranked England with a 61st-minute goal. The Three Lionesses, who failed to win a knockout match in three previous World Cup appearances, advanced to a quarterfinal on Friday against host Canada at Vancouver, British Columbia. The 11th-ranked Norwegians, the 1995 champion, had yet another disappointing World Cup. Norway finished fourth in 2007, then was eliminated in the group stage four years ago. Solveig Gulbrandsen put Norway ahead in the 54th minute with a glancing header off the back of her head that hit the underside of the crossbar and just went over the goal line. Houghton tied the game when she outjumped two defenders and from about 6 yards headed the ball in off Ingrid Hjelmseth's far post. Jill Scott, a 54th-minute substitute, then fed a perfect pass to Bronze, who was alone just atop the penalty area. Bronze punched a hard shot that glanced off a hand of Hjelmseth and into the net. Karen Bardsley had four saves and was selected player of the match. England, which has climbed the rankings in two years under coach Mark Sampson, earned Europe's third and final berth in next year's women's tournament at the Rio Olympics. England entered 3-11-2 against Norway but was 3-0-1 in their previous four meetings dating to 2006. That included a 1–1 tie in January 2014 in Sampson's first game as coach. The 32-year-old took over when Hope Powell was fired after England went 0-2-1 in the European Championship. The Scandinavians' best first-half chance came in the 11th minute, when Fara Williams's deep pass over the middle sent Isabell Herlovsen in alone. Driving into the penalty area, Herlovsen got off a shot only to be foiled by Bardsley, who came out to cut the angle and make the stop by kicking out her left foot. Despite the late-afternoon start, the game-time temperature was above 80 and the sun baked the Landsdowne Stadium's artificial turf. The conditions were similar to Germany's 4–1 win over Sweden on Saturday, when the temperature was measured at over 100 on the field. Near the 25th minute, Swiss referee Esther Staubli called for a water break.